Charles Brocas (1774–1835), Aristides (detail) (1806), oil on canvas, 235 x 183 cm, Musée des Augustins de Toulouse, Toulouse, France. Image by Didier Descouens, via Wikimedia Commons. Plutarch’s Lives progresses with a Greek hero who was a contemporary of Themistocles: Aristides (sometimes referred to as Aristeides). The two differed in their views over the way the Athenian city-state should be run. Themistocles was a champion of the people, and keen on opening government up democratically. Aristides, though, was a follower of Lycurgus, who had laid down the absolute laws of the Spartans. Ironically, both suffered as a result of the democratic votes which determined their ostracisation. The two statesmen were opposed in almost everything that they said and did. Aristides was a tireless and fearless defender of justice, even when it made life harder for himself. He was once prosecuting an enemy in court, and made such a good job of presenting the case for the prosecution that the judges wanted to proceed straight to a verdict without hearing the defence. Aristides then pled the case for the defendant to have a proper hearing, including that of his defence. He first made his reputation as a general at the Battle of Marathon (in 490 BCE), in which the Athenians defeated King Darius the First’s Persian army even though the Greeks had less than half the number of men. The commander there was Miltiades, but it was the forces under the immediate command of Themistocles and Aristides who saw the most and hardest action. According to the account of Herodotus, there were two singular athletic achievements associated with the Battle of Marathon: in one, an Athenian named Pheidippides ran more than 225 km (140 miles) from Athens to Sparta to ask for assistance before the battle started. In the other, the Athenian forces marched at great speed from the battlefield back to Athens, a distance of 40 kilometres (25 miles), to counter a Persian force which was travelling by sea to the city. Luc-Olivier Merson (1846–1920), The Soldier of Marathon (1869), further details not known. Wikimedia Commons. Plutarch is one source who conflates these, and elsewhere claimed that a runner named Erchius or Eucles ran from Marathon to Athens to announce the Greek victory. 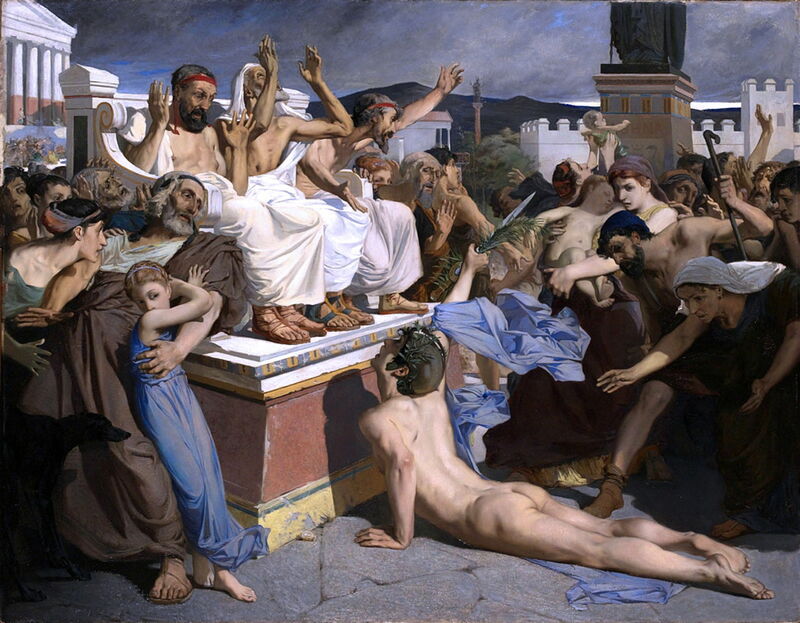 As shown in Luc-Olivier Merson’s painting of The Soldier of Marathon (1869), on telling of victory, the athlete – now named Pheidippides or Philippides – collapsed and died. Merson’s painting won him the Prix de Rome, and became a significant part of the growing Olympic movement, which culminated in the running of the first modern Marathon in the renewed games of 1896. 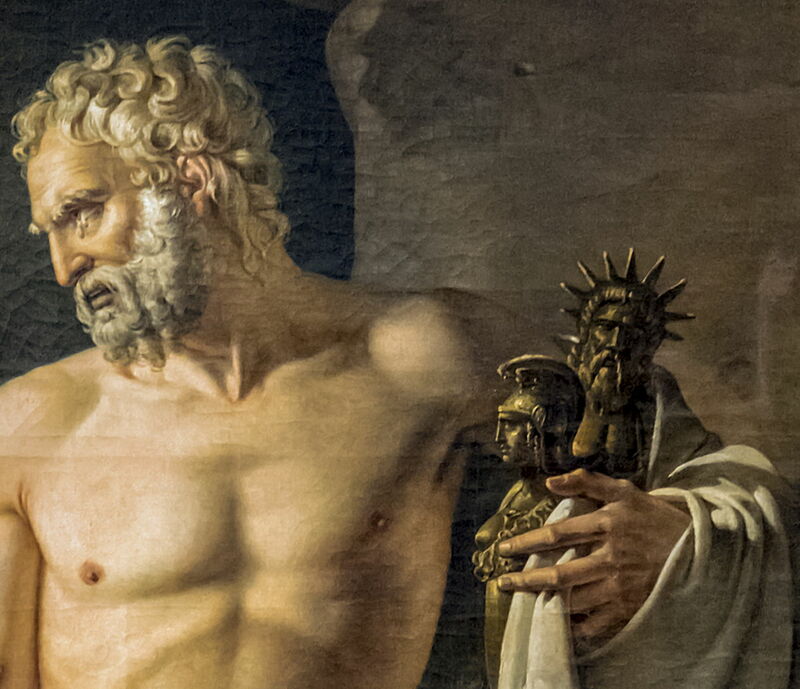 Aristides was made Archon, ruler over Athens, in return for his accomplishments at Marathon, and quickly became known as the Just, on account of his passion for justice. Inevitably, this gave rise to jealousy, and Themistocles claimed that Aristides had abolished the courts of law, and was judging cases in private instead. This led to Aristides being ostracised, and banished from Athens for ten years as a result. 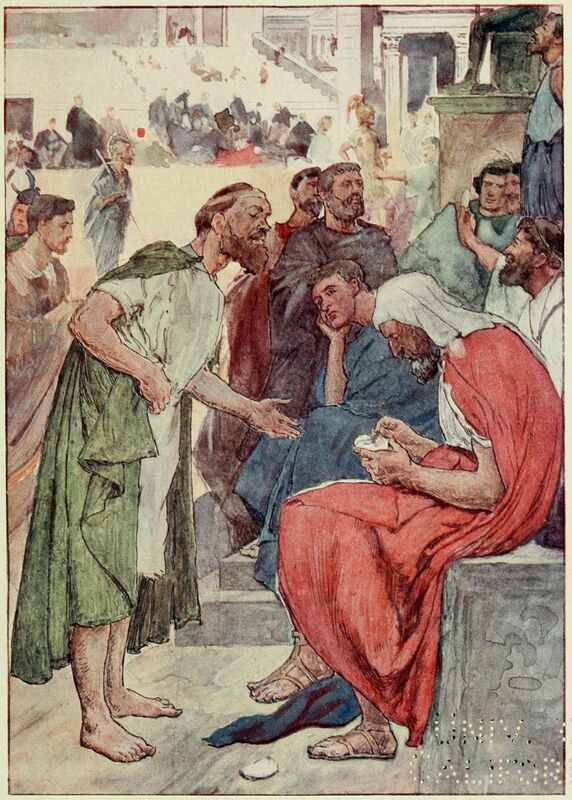 William Rainey’s illustration of Aristides and the Citizens from about 1900 shows a story told by Plutarch of the vote for his ostracism. An illiterate and boorish man came up to Aristides during the vote, and (not knowing who he was talking to) asked Aristides to write the name of Aristides on his fragment of pottery, so that he could cast it as his vote. When Aristides asked why he had chosen to vote for Aristides to be ostracised, the man said that he was tired of hearing him always being called ‘the Just’. Such are the vagaries of the vote of the people even today. Charles Brocas (1774–1835), Aristides (1806), oil on canvas, 235 x 183 cm, Musée des Augustins de Toulouse, Toulouse, France. Image by Didier Descouens, via Wikimedia Commons. 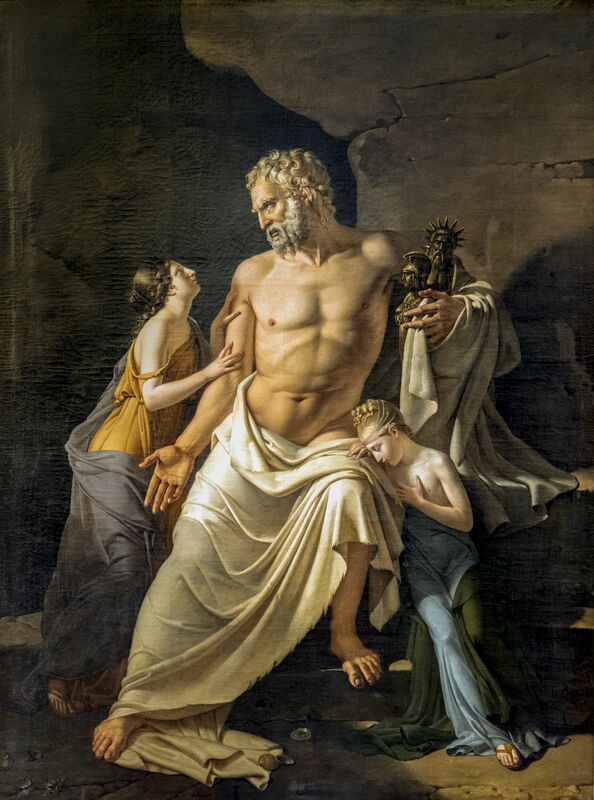 Charles Brocas’ large portrait of Aristides, which was completed, and exhibited in the Salon of 1806, shows the statesman weeping with his two daughters, as they shelter in a cave at the start of their banishment. His left arm clutches their few possessions: a thin cloak, and small statues of the goddess Athena, and of Zeus himself. This banishment was rescinded after only three years, when Xerxes and his army invaded the countries to the north of Athens. Aristides returned as a general, and he and Themistocles agreed to work together, with the latter as overall commander for the Battle of Salamis. During that naval engagement (won by the Greeks), Aristides captured the small island of Psyttaleia in the straits of Salamis, where he ensured that no Persian was safe. 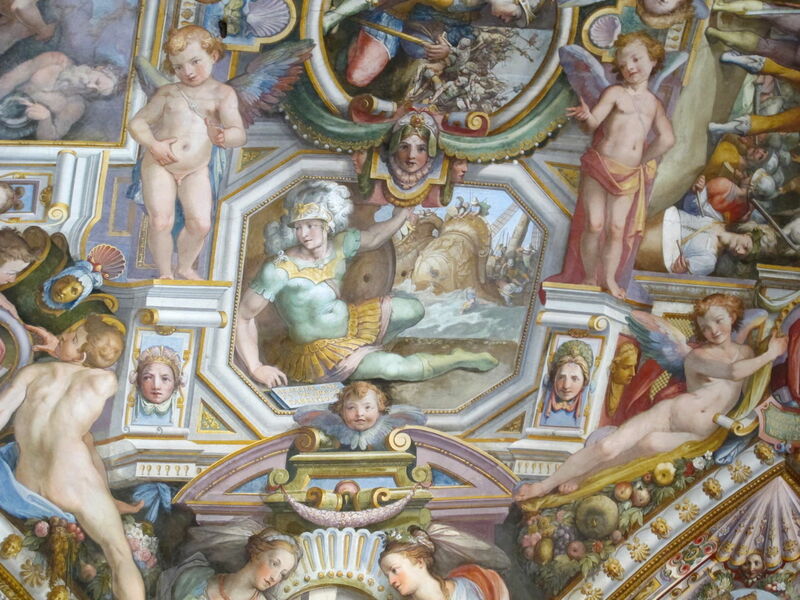 Bernardino Poccetti (1548–1612), Aristides (1583-86), fresco, dimensions not known, Palazzo Capponi-Vettori, Florence, Italy. Image by sailko, via Wikimedia Commons. I think it is his role in the Battle of Salamis which Bernardino Poccetti celebrates in his fresco of Aristides (1583-86) in the Palazzo Capponi-Vettori in Florence, Italy. Its inscription reads Aristide che fu un greco fabritio, which I think means something like ‘Aristides who was a Greek smith’ (a smith as in a builder of nations). Aristides was then put in command of eight thousand Athenians, which joined forces with Pausanias and his Spartans to fight the Persians one last time at the Battle of Plataea in 479 BCE. After an initial cavalry battle, the Persians intended to attack the Greeks by surprise. Aristides was forewarned of that attack by the king of the Macedonians, which helped the Greeks repel the Persians the following day. Eventually the Persians launched more attacks, but the Spartans and Athenians got the upper hand. The Persian commander was killed by a Spartan soldier, and the Persian force shut themselves up in a stockade, where the Greeks overcame them and slaughtered most of their enemy. Hugh William Williams (1773–1829), The Plain of Plataea, from Mount Cithaeron (c 1824), original details not known, engraving by William Miller (1796–1882), in ‘Select Views In Greece With Classical Illustrations’, London, 1829. Wikimedia Commons. 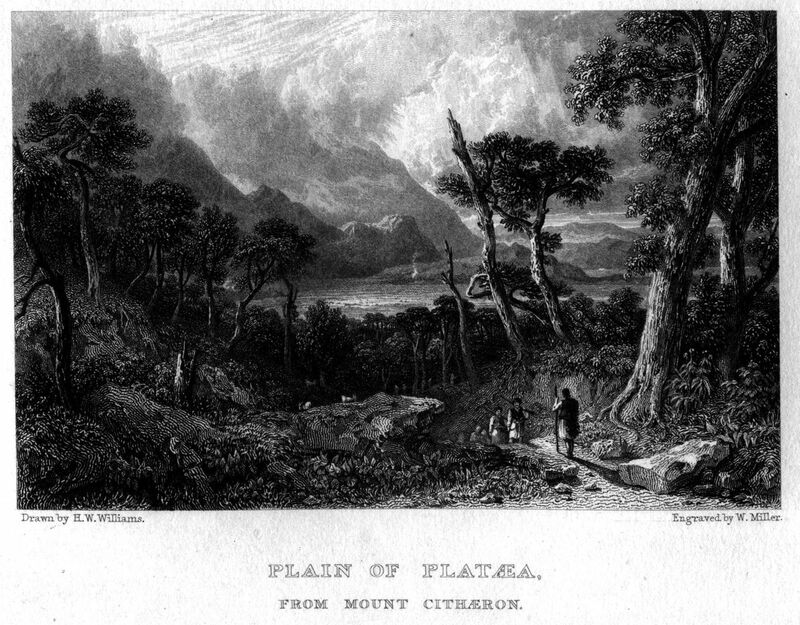 Although I cannot find any trace of Hugh William Williams’ original painting of The Plain of Plataea, from Mount Cithaeron (c 1824), this engraving by William Miller gives a good idea of the terrain at the foot of the mountain where the Greeks and Persians met in battle nearly 2,500 years ago. After this, Aristides played an important role as an intermediary between the smaller Greek states and Sparta, ensuring that the city-states paid fair contributions to maintain their alliance. During his life as a statesman and general, Aristides’ constant fairness did not bring him riches. Plutarch is undecided as to where he met his death, but states that his tomb at Phalerum, on the coast by Athens, had to be built by the city, as his estate was insufficient to cover its cost. For, unlike so many of his time, Aristides the Just had never extracted funds from the public purse to line his own pockets. Posted in General, Life, Painting and tagged biography, Brocas, history, Merson, morality, painting, Plutarch, Poccetti, Rainey, Williams. Bookmark the permalink.